Blueberries lend their great flavor to many different frozen desserts. This easy blueberry sorbet recipe takes advantage of their natural sweetness to make a healthy and delicious dessert. It uses a little lemon juice and salt to enhance the flavors and balance the sweetness, so you will have sorbet that tastes like fresh, ripe fruit. Making sorbet is one way of enjoying fresh blueberries in season. You may have them from your garden, pick them at a local orchard, or buy them at the farmers' market. Blueberries that are just at the point of ripeness are best since they still have some acid and tannins. If you use overly-ripe blueberries they have lost this complexity. When the blueberry season has passed, you can still make blueberry sorbet using fresh frozen fruit. Commercially frozen blueberries are picked at their peak and they will make a lovely sorbet. Heat the sugar and water in a small saucepan over medium-low heat until the sugar is completely dissolved. This should take about five minutes. Add the salt and lemon juice to the warm sugar syrup. Puree the liquid with the blueberries in a food processor or blender until completely smooth. Chill your blueberry sorbet base in the refrigerator until it is cold. Chilling for at least an hour is a good estimate, although you can also put this together before bed and refrigerate it overnight. Freeze the sorbet according to the directions of your ice cream freezer. Eat the sorbet immediately or store it in an air-tight container in the freezer until you are ready to serve it. Decide what kind of texture you want. 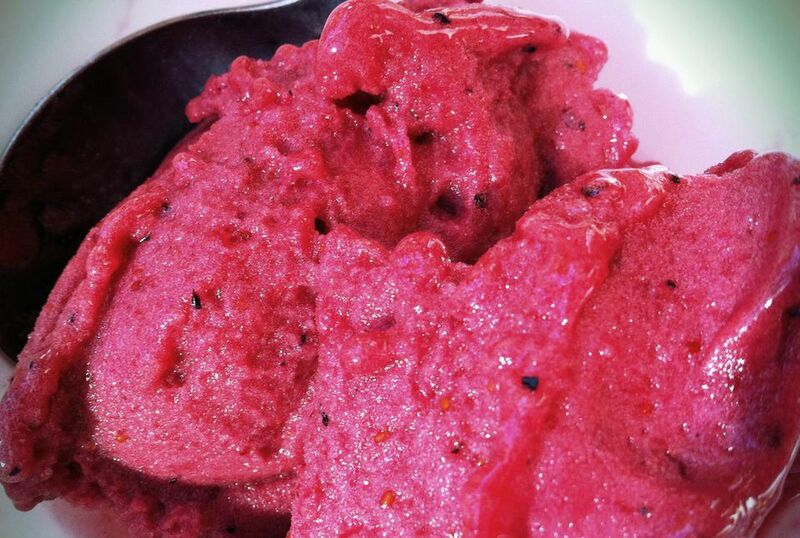 If you want your blueberry sorbet to be even smoother, strain it after you puree the ingredients together. Using a fine-mesh strainer or cheesecloth will remove the seeds and skins, so you have a very smooth texture. There are tons of ways to use frozen fruit. You won’t be able to tell the difference between using fresh or frozen blueberries for this sorbet recipe. However, make sure that the blueberries don’t have added sugar or you will need to adjust the recipe. Defrost the berries before you puree them so you get the right texture for the finished product. Although this recipe can be made with less sugar, it will impact the finished product. Fresh sorbets can get especially hard in the freezer if they don’t have plenty of sugar or a little alcohol in the recipe. If you plan on reducing the sugar, make sure to eat it right away.